Built to resemble a British-colonial paddle steamer, Anawrahta is a vessel with spacious cabins, a passenger-to-crew ratio of 1:1 and very high levels of personalized service. 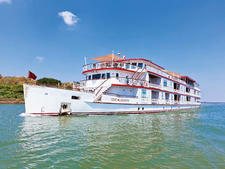 It is owned by the Heritage Line and cruises on the Irrawaddy and Chindwin rivers in Myanmar (Burma). Named after the founder of the Burmese nation, with its gleaming rails, polished lacquer, intricately carved woodwork and handmade furniture, the vessel has been built to reflect the elegance of a bygone era. 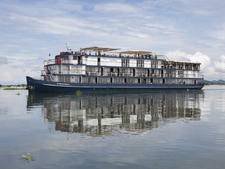 It has 23 large cabins in four categories, which range in size from 517 square feet to a huge 926 square feet. Onboard facilities include a panoramic lounge, pool, spa, sauna and gym. Anawrahta's 10 Deluxe and six Deluxe Executive staterooms, all with private balcony, measure 344 square feet and are decorated with original handicrafts, locally carved wood panels and richly textured fabrics. The Deluxe cabins are situated on the Main Deck and the Deluxe Executive cabins are a level above on the Upper Deck. Named after rivers in Myanmar, there are three Junior Suites: the Kaladan, Lenya and Thandi, which all measure 517 square feet. Combining dark wood with bright orange, saffron and green colors inspired by the floral offerings presented at local temples, these suites all have private balconies. Situated on the topmost Terrace Deck are the two Executive Suites -- the Chindwin and Yangon -- that measure 635 square feet, including an indoor seating area and a private balcony. Polished wood, locally made brocade and artifacts collected in Mandalay, Bagan and Yangon create an exotic ambiance, and these suites have large marble bathrooms. The two Royal Suites are located at the front of the vessel on the terrace deck. These luxurious accommodations are named after Anawrahta and his son Kyansittha, considered two of the most famous monarchs in Burmese history. They measure 926 square feet, including a 312-square-foot balcony with an outdoor whirlpool. The interiors boast elaborate wood carvings, fine works of Burmese art and handmade artifacts. Inspired by the lavish decorations of old Bagan and Mandalay, Anawrahta's Hintha Hall Restaurant has white tablecloths and gleaming glassware surrounded by polished wood, intricately carved floor and ceiling panels and panoramic windows. The restaurant seats all 46 passengers in one sitting, and in addition to international dishes, the chefs showcase the authentic flavors of Myanmar, which has been influenced by Chinese, Thai and Indian cuisine. Thanks to the county's long coastline, seafood plays a prominent role, as do fresh herbs, aromatic spices and seasonal vegetables. A typical Burmese meal might include a light soup, steamed rice, a fish or meat curry and local salad, known as thoke. Due to the nation's Buddhist culture, there are always plenty of vegetarian options. The heart of the ship is Kipling's Bar, on the terrace deck, which has large windows and colonial-style rattan chairs. The spa has three massage beds, mani-pedi stations and a steam room. Daily yoga sessions take place on the Sun Deck. 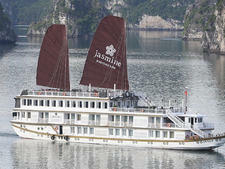 Cruises feature lectures and demonstrations about Burmese culture, traditional dance performances, open-air movies and cocktail events. 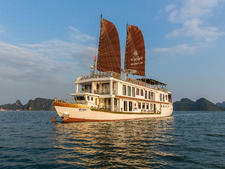 Anawrahta sails on two-, three- and four-night cruises along the Irrawaddy from Mandalay to Bagan, or in reverse, and a seven-night sailing in northern Myanmar on the Irrawaddy. It also offers an 11-night expedition cruise along the remote and lesser-known Chindwin, which is ideal for passengers looking for an off-the-beaten-track adventure.